Sherry Hall marvels at how God took the assorted pieces in her life, arranged them for her, and showed her what to do. “It was hard and scary, and I didn’t think I was capable of making it happen,” she reflects. Proudly guiding me through the new and improved, brand new barn in Defuniak Springs, Florida, Sherry points to a wooden sign hanging in the office – We are seldom qualified for the things God calls us to do. For people of all capabilities, therapeutic horseback riding provides mental, physical, and emotional stimulation. Therapy and rehab exercises can be difficult and dull for those with depression, epilepsy, autism, and down’s syndrome. But watching the big smiles and the excited faces at Grace Rides is all the proof you need – riding a gentle, loving horse can help kids and adults make remarkable progress. On her family’s working farm in northwest Florida, Sherry grew up riding horses and helping out at her mom’s special education classes. Armed with a trio of degrees from Florida State – Clinical Psychology, Rehabilitation Counseling, and Law – Sherry initially advised high school grads with spinal cord injuries who wanted to attend college and be independent. Sherry and her husband, Steve, founded Grace Rides, a 501(c)(3) equine therapeutic riding center, in 2008. Operating on a “postage-stamp sized piece of property” in Niceville, Florida, Sherry admits she was scared to death and didn’t think she was qualified to undertake the project. But she just kept taking the next, right step. As we watch the pre-teen riders – spotters and handlers beside them – mount their horses for this afternoon’s lesson, Sherry fondly gestures to one of her young students. 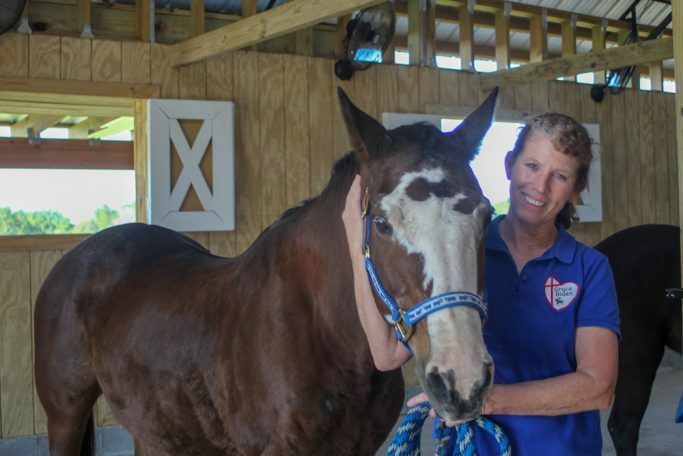 Eight years ago, when Nelson* began working with Sherry and the Grace Ride instructors, he could not lift his leg high enough to get on a horse. Other types of therapy and exercises had not interested him. But riding the horse was something he wanted to do, and this desire unlocked a new motivation in Nelson. “If they want to get on a horse, we can help them accomplish amazing things,” says Sherry. Kids and adults with spina bifida and cerebral palsy and multiple sclerosis and brain injuries “open up around the horses” at Grace Rides, Sherry explains. The excitement – and fun – of riding a horse around a tree-lined oval makes them feel good about themselves. They learn patience, responsibility, and compassion as they groom, feed, and ride the sweet-natured animals. Sherry points out the simple rhythm of the horse’s steps loosens tight muscles and strengthens muscle tone. The warmth from the horses’ bodies helps with circulation and digestion. The instructors run the young riders through a series of games this afternoon. Lifting their arms like an airplane, passing batons, and smiling constantly, the pupils work on their hand-eye coordination, their left and their right, and balance. Being outside, interacting with animals, playing games with no judgement…. What better way to build fine and gross motor skills? For all the students, including the group of veterans riding earlier today, “consistency is key,” Sherry stresses. It is important to ride the same horse with the same horse savvy volunteers and certified instructor every week. According to Sherry, “Consistent social groups increase conversation, adaptability, and cooperation.” The riders develop respect and love and compassion for their beautiful, friendly animals, and this creates confidence. Stroking Emily, a black mare, I ask Sherry how she acquired “the equine helpers” with the gentle, accommodating temperaments and dispositions. Of her 18 horses and lone donkey (Nestor), many were donated by families with kids leaving home or heading off to college. Others have been rescued by animal lovers – or Sherry herself. “Whoa-ing their horses” and wrapping up the games and exercises in the riding ring, the riders stretch waaaay over to give their equine buddies a big hug. It’s now time to feed their friends apples, brush them, and say goodbye for the week. And I am guessing, based on the looks on their faces, they will start talking about the next riding session as soon as they leave! You may also enjoy reading stories about adaptive snow sports and law enforcement canines. My son’s day care provider when he was around two years old ended up owning a therapeutic riding stable. I had the chance to visit another one (not hers) owned by a woman with two severely disabled sons in their teens. A lot of her clients are veterans with PTSD. I saw first hand the therapeutic riding in action. It’s an amazing thing. It is amazing. I had no idea simply riding the horse helped the body as much as it does. Thanks for reading. does make me sad I didn’t manage to get on a horse at all this year – but it’s so good that people do all the work to make riding available to people who benefit from it so much. Horses are the best.